What would gal pals do without their phones! 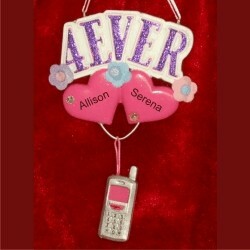 The 4EVER - forever friends personalized Christmas ornament sports flowers and just the right colors for a pair of young girls who heat up their phones with long talks and quick texting. Each of these kids ornaments personalized by hand arrives in our posh and pretty velvet gift bag, a Russell Rhodes exclusive. Surprise a young girl and one of her chatty friends with the 4Ever friend Christmas ornament personalized with their names. From best friend Dec 21, 2014 Tessa W.